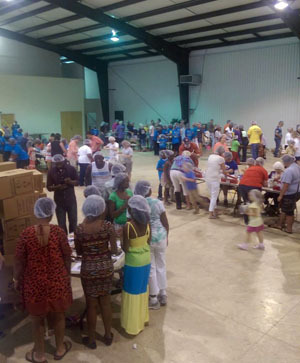 Photo right: Picture taken during the Tupelo District packing event in September 2014 where 15,120 meals were packaged. Drumroll please. The Mississippi Annual Conference has packaged roughly 933,616 meals for the hunger relief agency Stop Hunger Now! The goal is to pack one million meals before annual conference session 2015 that begins on June 4. With nearly four months to the start of the session, the woman leading the charge, Delphine Swanson is confident Mississippi United Methodists will prevail, and produce the extra 500,000 meals that her husband Bishop James Swanson Sr. challenged the Mississippi Conference to prepare. Swanson kicked off the campaign at the June 2014 annual conference session where members packed 102,168 meals. "God is so good. However, there is still more work to be done. If you have not had the opportunity to take a part in our conference effort to pack 1,000,000 meals, the opportunity is still there. We would like every church and every member in our conference to take a part in this mission," said Swanson. One way individuals and churches can have a hand in the effort is to donate to the conference youth. They are hoping to pack 100,000 meals when they come together for The Gathering 2015 in Jackson, MS, Feb. 27-March 1 at Christ UMC. "The youth of our conference are working very hard to host a Stop Hunger Now packing event, also. If you are unable to host a packing event at this time, we ask that you support our conference youth and donate to their part of our goal," said Swanson. So far the youth have about $5,000 to host a Stop Hunger Now packing event. They need $29,000 to make their target meal count. Click here to make donations to support The Gathering and Stop Hunger Now or mail a check to the MS United Methodist Conference Office at 320-C Briarwood Drive, Jackson, MS 39206. "We can do it," said Swanson. To track the one million meals goal for Stop Hunger Now on facebook, click here.